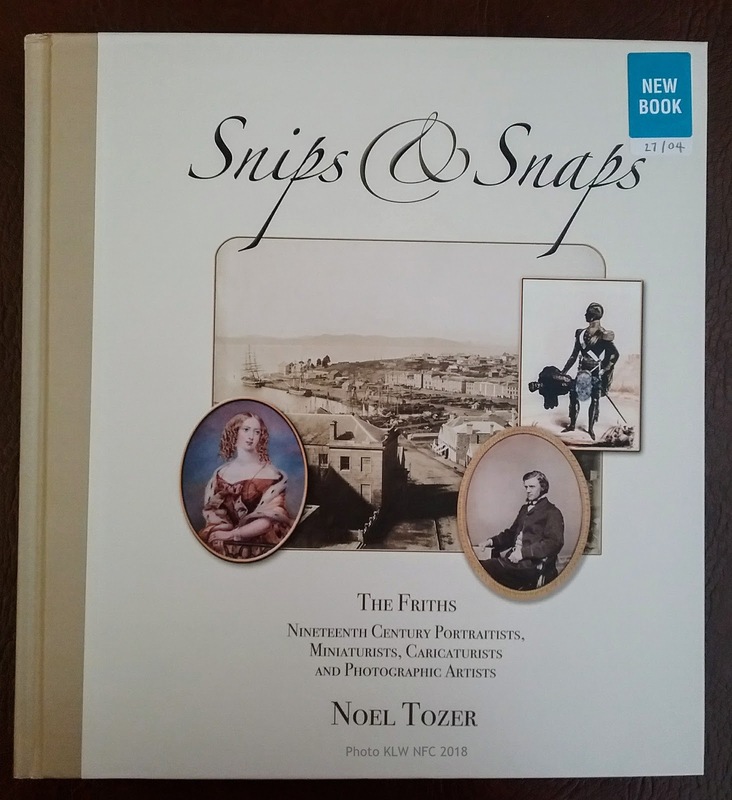 There is no doubt whatsoever that Noel Tozer, a descendant of the Frith family of artists and photographers, was – and still is – a victim of a confidence trick perpetrated by Christopher Long, an amateur photohistorian. Over a long period, at least from the 1990s, Chris Long has executed a LONG CON, a type of long-term scam which quite appropriately just happens to bear his name. To follow the means whereby the perpetrator of this confidence trick, Chris Long, with help from extra players, drew his mark Noel Tozer into his scheme, you would need to read the introduction to the book Snips & Snaps (2018). The longest con perpetrated by Chris Long goes back to 1984 when he was told a story about Port Arthur prison commandant A. H. Boyd. The list of photographers which Chris Long submitted to National Library of Australia Chief Librarian Dan Sprod a year before, in 1983, for the proposed A-Z directory of Tasmanian Photographers 1840-1940 (TMAG 1995) included Thomas J. Nevin with the note that his work had survived in reasonable quantity, but there was no A. H. BOYD on the original list. Chris Long had not heard of any photographer by the name of A. H. Boyd in 1983, because there never was a photographer by that name. A. H. Boyd was not a photographer, and certainly not THE photographer of Tasmanian prisoners at Port Arthur in 1874, but between 1983 and 1984, a year after Chris Long completed his “research”, the Boyd misattribution was fabricated at the Port Arthur Heritage Site and the TMAG (see Elspeth Wishart’s notes online against the mugshots she removed from the QVMAG to take to Port Arthur and returned to the TMAG). Thirdly, Chris Long’s admiration of Frith’s portrait photography, largely because of a connection with Frith descendant Noel Tozer meant he was far more interested in giving focus to Frith and his portraits of the gentry than any other 19th century Tasmanian photographer (see pages 1-3 of the letter here and below). Fourthly, and most important of all, it was Chris Long’s decision to steer clear of researching Nevin’s colleague Samuel Clifford because Dan Sprod was already preparing a book on Clifford’s body of work. By ignoring Samuel Clifford, Long had not the slightest idea of the extent or nature of Clifford and Nevin’s work at Port Arthur from 1868 to 1876. He knew nothing about the courts or judicial legislation and procedures requiring police photography in Tasmania by 1872. 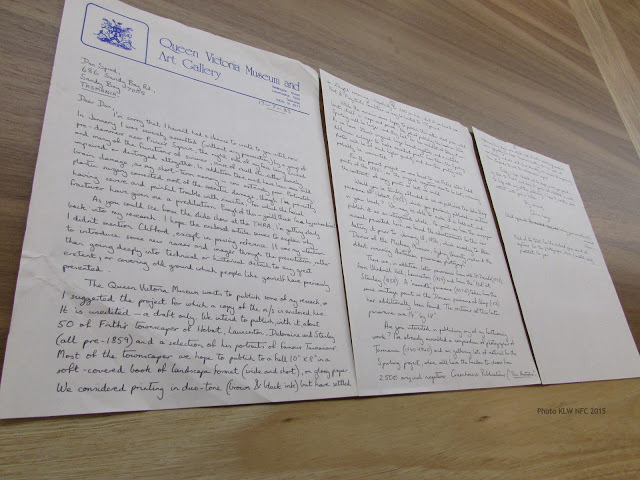 Moreover, he did not recognise Thomas Nevin’s stamp with the Royal Arms insignia as the standard issue insignia to all government contractors when commenting on Nevin’s photographs of prisoners in the TMAG publication of 1995. Locally-born A.H. Boyd (1829-1891) was an accountant at the Port Arthur prison in 1853, superintendent of the Queen’s Orphan School (July 1862-October 1864) where he was dismissed for misogyny, a stipendiary magistrate at Huon (1866-1870), and Civil Commandant of Port Arthur (June 1871-December 1873), a position he was forced to resign because of allegations of corruption and nepotism implicating his brother-in-law, Attorney-General W. R. Giblin. He was not a photographer by any definition. A. H. Boyd had no reputation during his life time as a photographer, and no photographic work exists by A. H. Boyd. His “amateur photographer” status originated as a rumour spread by descendants, which was published as a “belief” by Chris Long (1985, 1995) from the singular circumstance of Boyd’s presence at the Port Arthur site in 1873, a date which only approximates the date “1874” written on the verso of several dozen extant Tasmanian prisoner mugshots by collector John Watt Beattie for display and sale in his “Port Arthur Museum” in Hobart in the early 1900s. Chris Long jumped at the opportunity to promote his profile among photohistorians by naysaying prior curatorial expertise (G. T. Stilwell, Daniel Thomas, John McPhee, Joan Kerr) and published this “belief” in the A-Z reference, Tasmanian Photographers 18401-940: A Directory (1995: TMAG, Gillian Winter ed), It has been mistaken by several publishers and curators subsequently as a proven attribution. The surviving photographs of Tasmanian convicts in public holdings from the 1870s to the early 1880s were taken by the commercial photographer Thomas J. Nevin on contract to the Lands and Survey Department and the Municipal Police Office, Hobart City Council at the request of Attorney-General W. R. Giblin. Contrary to these postulations by apologists promoting the prison’s Commandant Adolarious Humphrey Boyd as the photographer of the extant 300+ police mugshots of prisoners taken in the 1870s (eg. Julia Clark 2010 and Warwick Reeder 1995, citing Chris Long 1995), there was no “dark room” at Port Arthur specifically designated for the photographing of prisoners in the 1870s. A. H. Boyd had no reputation as a photographer in his own life-time. No photographs ostensibly taken by him have ever surfaced, none have been profferred by either his descendants or their apologists who have rushed into print, and no document testifies to his training, skills, or official mandate. The “belief” in A. H. Boyd from these apologists is simply tourism spin, a deception which scams visitors to the Port Arthur Historic site and maintained there to this day to justify the fish-bowl furphy of the prison theme park as a model of insular self-sufficiency worthy of World Heritage status. So far, Tasmanian photography on paper had only been applied to the production of portraits. 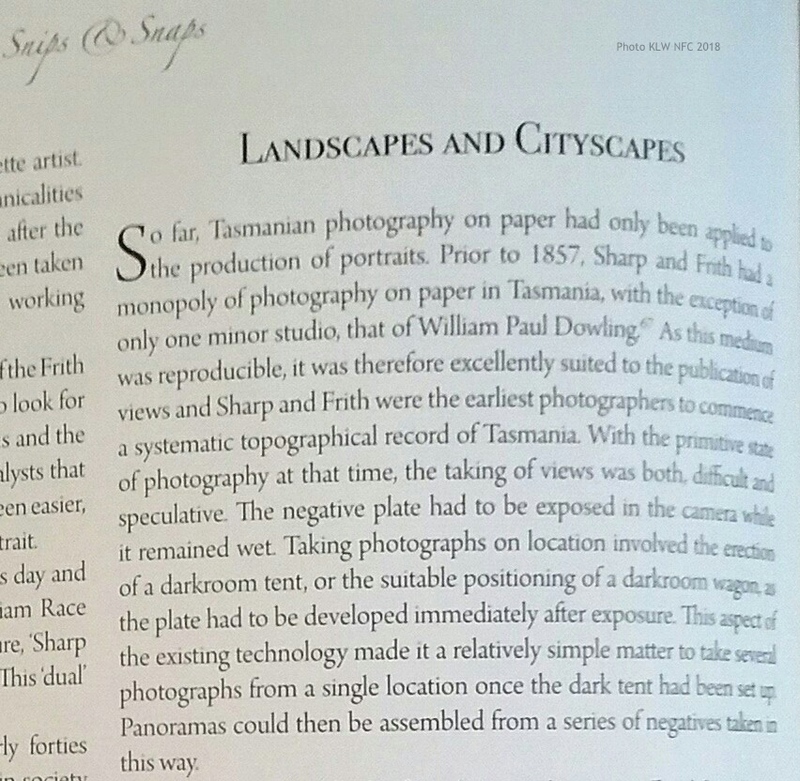 Prior to 1857, Sharp and Frith had a monopoly of photography on paper in Tasmania, with the exception of only one minor studio, that of William Paul Dowling 67 [superscripted footnote 67 which is explained on page 127 – see below]. Confusing and time-wasting isn’t it! 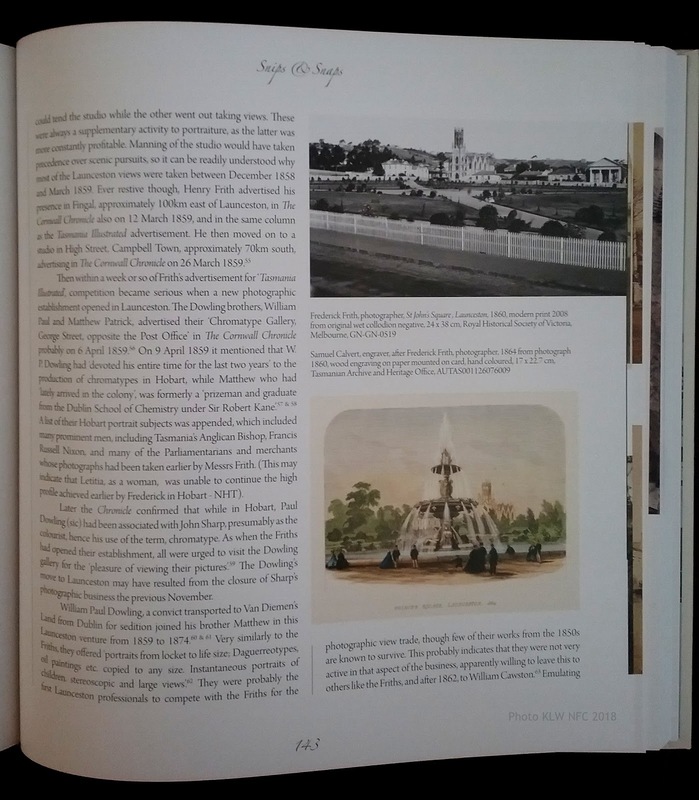 Firstly, the barely legible number for the footnote “67” on page 92, is appended to a non-factual statement: contrary to Tozer’s statement, Sharp & Frith did not have a monopoly of photography on paper before 1857. Douglas T. Kilburn, for example, produced sun pictures – calotypes – on paper and exhibited them at the Paris International Exhibition of 1855. In fact, Douglas Kilburn was a prominent contributor to proceedings of the Royal Society of Tasmania with lectures (December 1853-1854) and demonstrations on the production of his photographs taken around Hobart of streetscapes and buildings – see addenda below. Both photographers, William Paul Dowling and Douglas Kilburn were active before 1857 and both were residents of lower Davey St. Hobart , neighbours until 1856 of Captain Edward Goldsmith, uncle-in-law of photogapher Thomas J. Nevin whose 1860s stereographs on salt paper were produced according to Kilburn’s methods. Because of the footnote numbered 67 on page 92 the reader has to flip through thirty or more pages to find the content of footnote 67 in order to ascertain why the statement on page 92 was flagged and why it warrants explanation, only to find that ostensible author of this book Noel Tozer has deferred once again to the opinion of Chris Long: “67 Long advises… ” begins the wholly unnecessary and totally irrelevant quotation. Footnote 67 is testament to yet one more attempt by Chris Long to reinforce the lie at the heart of his fabrication from the 1990s of a photographic accreditation to the non-photographer A. H. Boyd for the hundreds of extant 1870s photographs of Tasmanian prisoners (called “convicts” in tourism discourse) known since that time to be the work of commercial and government contractor Thomas J. Nevin. Chris Long displays a total ignorance of the background to A. H. Boyd’s forced resignation from the Port Arthur prison job in December 1873, which was widely reported in the press of the day, claiming in this footnote that Boyd took photographs of convicts just before its closure in 1877. Boyd “probably” or otherwise did no such thing. The greatest irony is that Chris Long spent a few months at the QVMAG in Launceston in 1985 re-photographing as black & white prints a total of 40 uncut cdvs of prisoners taken by Nevin in the 1870s, fogging out cracks and scratches on the sepia originals in the process. Long’s impulse as usual was to satisfy his personal need to imprint his own fantasy on primary historical documents until the facts about them all but disappear under his gifted amateur touch (gifting himself and grifting others in the process). The originals of the 40 uncut cdvs had been removed from the prisoners’ Hobart Gaol rap sheets of the 1870s by JohnWatt Beattie and pasted in three panels for exhibition and sale in 1916. Furthermore, in this totally irrelevant footnote no. 67, Chris Long once again dismisses Jack Cato’s research published in 1979 which mentions W. P. Dowling’s contract to photograph prisoners at Launceston, and why? Because Chris Long “can find no evidence” to suggest otherwise. Having spent no more than a few hours in the Archives Office, Hobart back in 1983, it is little wonder. This is the fatuous modus operandi of Chris Long and his foolish flatterer, craven Julia Clark: if they say they can’t find some document, it therefore never existed. Even when such evidence does exist outside their narrow purview, they will never acknowledge their oversight, because they are now obliged to keep up appearances, such is the preening of egos where the promise of a journal article or printed book is the payout of the long con. The glib nonsense about A. H. Boyd is a non-sequitur to the whole book, since all three members of the Frith family of photographers (Henry, Frederick and Letitia) had permanently departed Tasmania by 1867, and none were involved in photographing prisoners in Tasmanian prisons. Given that Chris Long first published this furphy about A. H. Boyd back in 1995, and given the substantial research on these weblogs alone that prove once and for all that (a) A. H. Boyd was not a photographer and did not photograph prisoners at Port Arthur or anywhere else, and (b) commercial and police photographer Thomas J. Nevin was the government contractor responsible for the systematic photographing of prisoners from 1872-1886 at the Hobart Gaol, at the Port Arthur prison and at the Mayor’s Court, Hobart Town Hall, one has to wonder why Frith descendant Noel Tozer has acquiesced to this fabrication by Chris Long about A. H. Boyd. Why has Noel Tozer allowed Chris Long to take over this book with irrelevant and unfactual statements? We are told on the back cover that it is Noel Tozer’s first book. Chris Long has appealed to Tozer’s vanity and family pride, by appearing to be the handmaid giving birth to a first-time author. Tozer, op.cit. 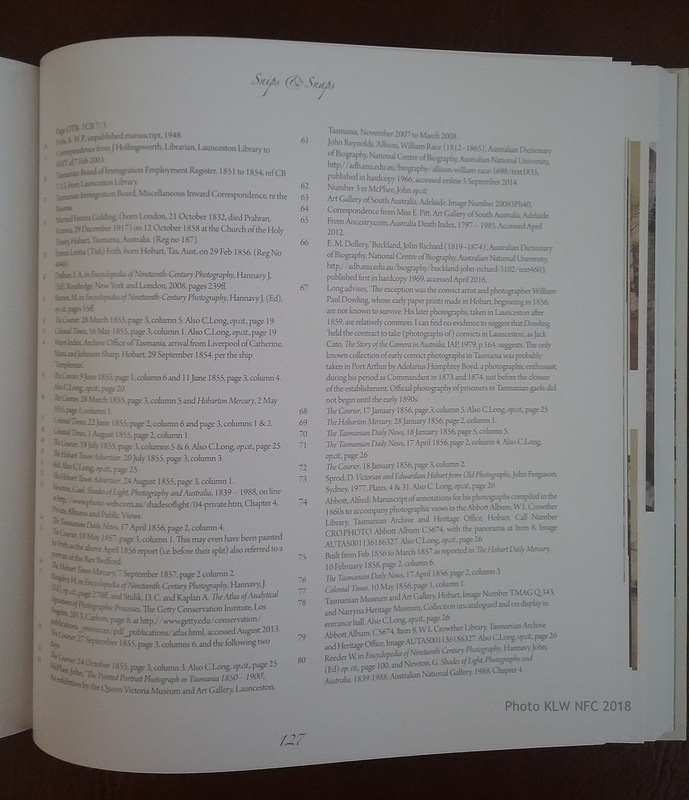 p. 143 – what is the grey vertical marker ? 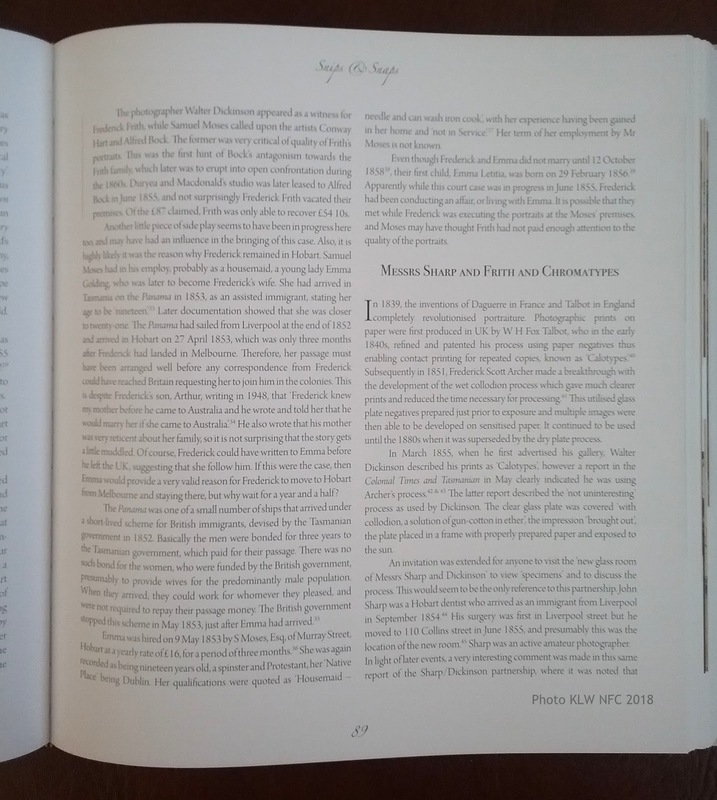 Turn to the index of Tozer’s book in the hope of finding the name of Douglas Kilburn or the photographic type “calotype” which Long redefines as “chromotype, and you will find nothing, yet several paragraphs, headed with the word “Chromotypes” (p.89) appear within the book. The index is next to useless. 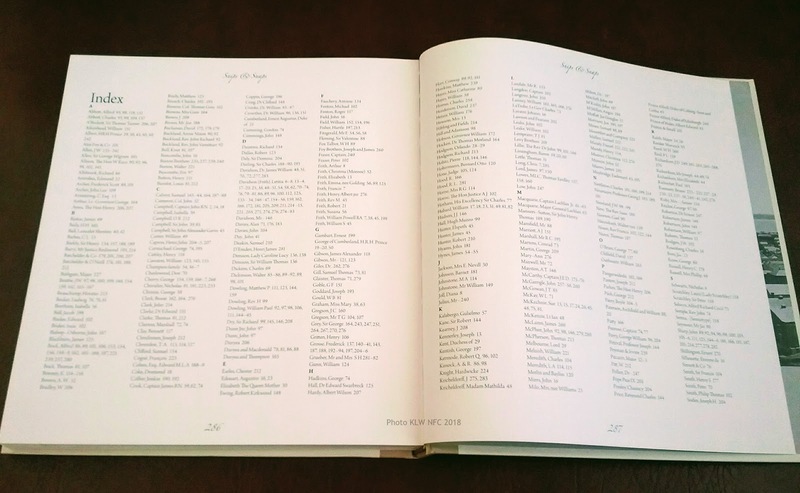 It is simply a limited list of the names of persons mentioned in the body of the text, some incidental and some altogether totally insignificant (like A. H. Boyd) while others of much greater significance like Douglas Kilburn miss out completely. Chris Long’s failure to mention Douglas Kilburn’s photography using paper was part of his scheme to make the Frith brothers’ photographic activities appear to be more prolific that they actually were and at the expense of the work of other photographers in the Tasmanian cohort of the 1850s-1860s. This in effect is Chris Long’s ego-driven blind-siding modus operandi. In order to pad out the Tozer book with his own so-called “research” he had to claim that dozens of photographs “found” in museum and library archives from the period 1850s-1860s, were the work of the Frith brothers if no attribution was catalogued, or claim the museum or library had made an error in attributing the items to another photographer. Many of Douglas Kilburn’s photographs on paper taken in the 1850s of Hobart streetscapes and buildings, some which he exhibited in Melbourne and at the Paris International Exposition in 1855 are not extant by name in public collections, a very odd lacuna indeed. There may be dozens extant but attributed instead to Frith simply because Chris Long has used impressionable museum and library workers – his schills – to effect his opinions with his imposture of “expert”. 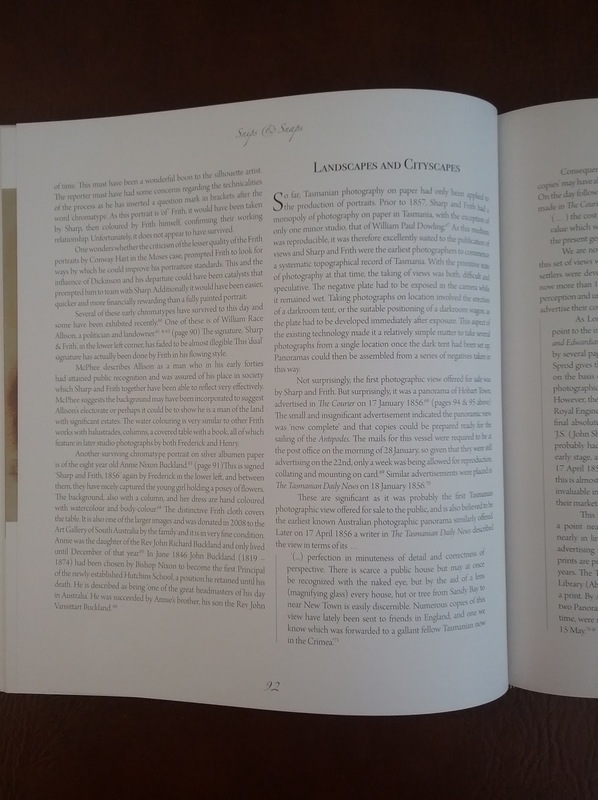 We have put the word “paper” in this lecture in bold print to underscore Chris Long’s ignorance or deliberate omission of Douglas Kilburn in the discussion of photography of paper (p.92). “THE publications on the principles and practice of Photography are already numerous, and many of them are written with perspicuity and method, so as to form excellent Vade-mecums for the student, whether he may have prosecuted the art for professional gain, or yielded to its delightful and seducing influence as an amateur. My present purpose is not, therefore, to give a history of Photography, or such an elaborate description of its principles as would involve a consideration of the theory of light and of the laws of optics and of practical chemistry, but only to make public, through the means of the Society, the process which I have myself employed in the production of a few calotype views of Hobart Town, &c., submitted for inspection at a late meeting of the Society. An enthusiast myself in the pursuit of Photography, I am anxiously desirous of leading others into the same delightful path ; but I am yet only a beginner, and venture with great diffidence to proceed. Under the general name of Photography are comprised various subdivisions and modifications of the art; such as Daguerreotype, Calotype, Anthotype, Cyanotype, Ferreotype, &c. Of these, the three following have been successfully prosecuted: the Daguerreotype, discovered in 1839 by M. Daguerre, a Frenchman,-the process now so universally employed for taking likenesses on metal plates ; the Calotype, or Talbotype, from Mr. Fox Talbot, by whom it was discovered in the same year,-the process upon paper which, however, is only adapted for copying landscapes or buildings ; the third is the process upon glass, by means of albumen or collodion,-it is the most recently discovered, and combining the advantages of each, it seems not unlikely, at no distant day, to supersede them both. I may here observe that collodion is a chemical compound of aether and gun-cotton. Though tolerably conversant with all the three processes mentioned, it is to the second only (the Calotype) to which I crave attention. And some large camel’s hair brushes. Before I describe the mode of preparing the papers, something may be said about the Camera that I use. Being desirous of taking views of a rather large size, I felt that unless some means could be contrived for diminishing the size of the Camera, the apparatus would be too bulky to be carried about without the aid of two or three persons. The focal length of my lens was about 21 inches. I therefore, when lately in London, ordered a Camera to be made 24 inches in length, 15 in width, and 13 inches in height, and without a top, which I replaced with a double fold of black calico. The ends were made to slide into grooves, and the sides to fold with hinges flat upon the bottom, which greatly lessened its bulk, and made it easy of carriage. The stand for the Camera is of French manufacture, has folding legs, and is light and portable. My lens, which is by Ross, of Holborn, London, is a compound double achromatic one, of 3¼ inches in diameter; when used for the Daguerreotype, it has a focal distance of about 12 inches, and will cover a plate of about 5 by 4 inches. To adapt it for the Calotype process, I unscrew the two glasses next to the paper, and substitute for them the glasses from the opposite end, with the convex side next to the paper: it has then a focal distance of about 21 inches. To correct the aberration of the rays of light, I place at about 2½ inches in front of the lens, a diaphragm which has an aperture of only a quarter of an inch. A large quantity of light being thus cut off renders the time of exposure very much longer ; but as a compensation, the details of the picture are much sharpened, and the lines at the sides are tolerably straight. Before leaving this part of the subject I must mention, as a curious fact, that these pictures cannot be taken quite so quickly here under the glorious sunshine, which so dazzles our eyes, as in the apparently unfavourable atmosphere of London,-I speak of the west end of London, not of the city, and of course exclude the real London fog days. The reason is, that the quality of light here is too yellow for photographic purposes. The more northerly we go, the whiter the light becomes; and the whiter the light, the quicker a photographic picture of any kind can be taken. It is well known that every beam of the sun’s light is composed of a collection of rays, which may easily be separated and shown apart by allowing the beam of light to pass through a common glass prism, by which they are refracted, and may be thrown obliquely upon any white surface. It is likewise known that each collective beam or ray which proceeds from the sun possesses three distinct properties-namely, the property of heat, of light, and of actinism, or chemical power. By experiment we can determine to which portion of the coloured spectrum each of these three properties belongs;for instance-the maximum strength of the heating ray is found to lie between the colours red and crimson; that of the lighting ray between the yellow and orange colours; whilst the greatest power of the chemical ray is between the violet and indigo. Curious as it may appear, it is nevertheless true, that neither the light which we see, nor the heat which we feel, have any thing to do with the production of pictures by the sun ; it is to the actinic, or chemical and invisible ray, that we are indebted for the wonderful power of so minutely delineating Nature’s works and copying the master-pieces of art. The photographist can easily prove the above facts to be correct by the following experiments:-Let him prepare a piece of photographic paper in the usual most simple manner, namely, by a wash of ammonio-nitrate of silver. This paper, if exposed to the sunlight in Hobart Town, at this season of the year, ought to become quite black in less than ten minutes. By preparing a second piece of paper in the same manner, and submitting it to the sun’s rays, with a piece of yellow glass placed over it, the paper will be found nearly insusceptible of change; but if the same prepared paper be similarly exposed, with a piece of blue glass, of a colour so deep as apparently to obstruct all light, placed over it, the paper will blacken nearly as fast as if it were exposed to the unveiled sunlight. The knowledge of this fact enables me to prepare the papers (in that part of the process which would suffer from daylight) without the aid of a lighted candle, by the substitution of a medium of yellow calico, which thus cuts off the actinic rays, while it allows those of light to pass through freely. The following experiment shows conclusively the different degrees of actinic power which belong to the various portions of the spectrum. The rays being thrown by means of the prism upon a sheet of paper, photographically prepared as before, the paper will be found to be very unequally darkened ;-at the chemical rays, represented by the colours blue, indigo, violet, lavender, and beyond that shade, the paper will be found to have the intensest black; at the lighting rays, shown by the colours yellow and orange, the paper will retain its primitive whiteness; and lastly, at the heating rays, to which the crimson belongs, the paper will be but slightly affected : the actinic power therefore seems also to belong, though in a minor degree, to the red and the crimson, representing heat-a circumstance which has not yet been satisfactorily explained. The light in Australia, therefore, is too yellow for the production of very quick pictures by any of the photographic processes; but it is only a question of time, not of distinctness, upon that account. It is stated that the nearer we approach the equator, the more feeble become the chemical rays; and consequently the more difficult are the pictures to be obtained. But, besides the chemical power being stronger or weaker in different latitudes, it is also found to be affected by the seasons and by the different times of the day; thus the Spring and Autumn, and the early morning, are found to be the·most favourable periods for the production of quick pictures. I shall now proceed to describe my method of preparing the papers. PREPARATION OF THE NEGATIVE PAPER.-CHOICE OF PAPER. Whatman’ s English paper is very good, but rather too thick for negative pictures, and hardly sufficiently well sized for positives. Turner’s paper is good, but too expensive. Canson-fre·res, a French paper, is very well sized, but a little too thin for negatives, and more so for positives. The above, however, are the best papers with which I am acquainted. Take 20 grains nitrate of silver, and dissolve in i an ounce of distilled water in a small glass-stoppered bottle. Take also 4 drachms of iodide of potassium. 4 grains of bromide of ditto, and dissolve in ½ an ounce of distilled water in another glass bottle. These mixtures will not spoil by keeping, but ought not to be exposed to daylight. pencil one side, that you may know it again, pin it by one or two of the corners on to a deal board a little larger than the paper; then holding the board inclined, dip a clean large camel’s-hair brush into the compound solution just described, and brush the paper smoothly and evenly across the sheet, and afterwards from the top to the bottom; the greatest care being taken that no part of the paper is omitted in brushing it over. Dry by hanging the paper up by one corner; half-a-dozen papers may thus be coated at once. When quite dry place the papers with the coated face downwards in a large tub of clean water, and let them soak in it for twenty·four hours or so, according to the heat of the atmosphere; when taken out and dried, by hanging up by the corner, they will be found to be tinted on the prepared side of a delicate straw colour. They will keep for any length of time without being affected by the light, care being taken never to touch the prepared surface with the fingers. 2nd Operation – The Sensitive Solution. The following process must be performed by the light of a candle, or if by daylight it must be passed through a yellow medium, and the chemicals must be carefully guarded from the sun-light. Take 25 grains nitrate of silver, 1¼ drachms acetic acid, ½ an ounce of distilled water, mix in a glass bottle, then make a saturated solution of Gallic acid with distilled water in another bottle; when required for use mix 15 drops of the aceto-nitrate solution, with 30 drops of saturated Gallic acid, in 6 drachms of distillecl water. Brush this into the prepared side of the paper, fastened on a board as before, with a clean brush, and let it remain for about a minute, the board being inclined. Then place the paper between folds of blotting paper until nearly dry. It is now fit to be placed in the camera; and it is better to use it as soon as possible after the above preparation:-this last solution will not keep above a day. 3rd Operation – In the Camera. Place the paper prepared as above, and carefully secured from the daylight, with its face to the glass of the frame of the camera; then slide the frame into the camera. The focus of the object must previously have been carefully adjusted on the ground glass of the camera. The time of exposure can only be learned by practice; it will vary with the intensity of the chemical light on the day or season of the operation; also with the degree of care devoted to the preparation of the paper. 4th Operation – The Development of the Picture. The paper upon its removal from the camera rarely exhibits any trace of a picture. It must still more than ever be kept from the daylight. changed, or soaked in a strong solution of nitric acid. 5th Operation – The Fixing. Mix 1 part of saturated solution of hyposulphite of soda with 6 parts of clean water. This should be poured into a vessel sufficiently large to contain the paper lying flat. When the picture is considered to be sufficiently developed, it is to be plunged into this solution with the face downwards, and kept there until the yellow colour produced by the iodide of silver has entirely disappeared, which would be in about an hour. The solution will serve for a number of pictures if fresh hyposulphite is added occasionally, and the dirt extracted, by its being filtered through blotting·paper. 6th Operation – Removal of Hyposulphite. I soak the picture for some time in two vessels of water, then dry by hanging it up by the corner. This finishes the production of the negative picture, the most difficult of the two. In a perfect negative, nature is as it were reversed: the sky and bright lights should be quite black, and the trees and shadows ought to be nearly as white as the colour of the paper. The picture, if carefully fixed according to the above directions, will be quite unalterable by daylight. Care should be taken to keep the back free from spots and blots, as they would cause white blotches in the positive pictures, now to be described. 7th Operation – The Positive Paper, or Printing Process. Dissolve 8 grains muriate of soda (common salt), in 1 ounce of distilled water. Take a clean sheet of paper, and having, as before, marked one side, fix it on to a board and sponge it quickly and evenly over with this solution. Dry it, and keep it for use. 8th Operation – Sensitive, for Positive Paper. Dissolve 50 grains of nitrate of silver in 1 ounce of distilled water. Drop into this solution as many drops of liquid ammonia as will cause the white precipitate which then forms nearly to clear-then stop; add to it 4 or 6 drops of acetic acid, and shake up the mixture, which will keep without change if closely shaded from daylight. Brush this into the positive paper prepared in the above-mentioned manner; then dry it thoroughly (by candle-light only), and the paper will keep for twelve hours or so. 9th Operation – In the Pressure Frame. Place the prepared paper and a negative picture face to face, and then put them into the pressure frame, with the back of the negative picture next the glass; so that when placed directly opposite the sun, its rays may pass through the negative picture to the positive paper placed beneath. The improved pressure frames will permit half of the picture to be examined without disturbing it, which will enable the operator to watch the process. When sufficiently darkened, it should be removed and fixed as follows. 10th Operation – Fixing the Positive. Take 2 ounces of hyposulphite of soda, 1 quart of clean water. Make of these a bath in a tin vessel. Plunge the positive picture into the bath, and keep it in for an hour or two. The impression will appear to fade whilst in this bath, but when dried it will be found to have regained its tone. The colour or tone may to a certain extent be modified by the length of time that the picture is kept in the hyposulphite bath. This solution will serve for several impressions, and will improve by use. 11th Operation – And Last Process. Remove the picture from the above bath and pass it through two waters successively to cleanse it from the hyposulphite. It should remain in the last water for an hour or so. Then dry it as before directed, and it is finished. A hot smoothing-iron passed over it will deepen the tone considerably. The positive pictures never arrive at the sharpness and minuteness of detail which the negatives possess. The latter are made more transparent by saturating with white or virgin wax, and by this means the positives are rendered more distinct. The process of waxing, however, is very troublesome. Stains on the fingers may be removed by a strong solution of cyanide of potassium. I have thus succinctly described my modus operandi, which differs considerably from that patented by Mr. Fox Talbot. I have tried others, but I find this method the easiest and most certain. Some calotypists use successive washes or baths of nitrate of silver, and solution of iodide of potassium, &c. Some wash first with the iodide solution, and then brush on the nitrate washes. Others again use the iodide bromide solution alone, &c.: but it would take volumes to contain all the processes and fancied improvements. Without wishing to exalt the Calotype process above its great rival the Daguerreotype, I think that it possesses the following advantages:- Paper, the material upon which it is taken, is less costly and cumbersome than the metal plates of the Daguerreotype; the artist is not so much at the mercy of his subjects, as landscapes and buildings are not so troublesome to copy as nervous or fidgetty sitters for portraits ; and lastly, the power of producing an infinity of copies from one matrix is not the least of its attractions. On the other hand, the extreme minuteness of detail and sharpness of outline which the Daguerreotype gives is not to be obtained by the Calotype process. The time of exposure in the latter is fully five times as long as in the former, which renders its application to portraits impracticable. and the disappointed operator is at last obliged to acknowledge with regret that his negative is a failure. The most frequent cause of these disagreeable failures is, I think, the presence of organic matter in the water used in the first operation, which cannot always be obtained quite pure. Newly-caught rain water or spring water, not too hard, are the best. Other causes of failure are the following. The paper may not be evenly or well made, the size upon it may not be pure, the paper may have been touched by dirty fingers; the chemicals may have been spoilt by the voyage from England, may not be pure, or may not be evenly spread upon the paper. Many trials and the greatest care are requisite to produce even moderately good impressions. “When, however, really good negatives of interesting subjects are obtained, they are truly valuable; as with care an unlimited number of copies may be procured from them, each slightly varying in tint from a rich brown to jet black. If successful, the enthusiastic photographist feels that his labour is repaid, since he possesses the power of making copies from nature which in tint rival sketches produced in sepia and Indian ink, and surpass them in accuracy and minuteness. The labour of several days must be applied to the production of sketches by the hand such as would compete in finish with the pictures produced by the sun in a few minutes. The value of the Calotype pictures to the artist, as subjects to copy from, is very great. By their aid he is enabled to correct his perspective; to carry into his studio the designs from which he can work up his drawings to the highest degree of finish; to give to each object in his picture its exact size and value,-as it often happens in drawings that more than a proper degree of importance is given to objects which in nature are small and insignificant; and lastly, to use the calotypes as a study for the correct mode of throwing the shadows,- for nature itself, being its own artist, cannot err on these points. Reference: ‘On Sun Pictures by the Calotype Process. By Douglas T. Kilburn. Esq. Read 4th December, 1853’, Papers and Proceedings of the Royal Society of Van Diemen’s Land, vol. 2, part 3 (January 1853), pp.446-59. “Vulnerability to confidence tricks: Confidence tricks exploit typical human characteristics such as greed, dishonesty, vanity, opportunism, lust, compassion, credulity, irresponsibility, desperation, and naïvety. As such, there is no consistent profile of a confidence trick victim; the common factor is simply that the victim relies on the good faith of the con artist. Victims of investment scams tend to show an incautious level of greed and gullibility, and many con artists target the elderly, but even alert and educated people may be taken in by other forms of a confidence trick. Stages of the con In Confessions of a Confidence Man,Edward H. Smith lists the “six definite steps or stages of growth” of a confidence game. He notes that some steps may be omitted. Foundation Work Preparations are made in advance of the game, including the hiring of any assistants required. Approach The victim is contacted. Build-up The victim is given an opportunity to profit from a scheme. The victim’s greed is encouraged, such that their rational judgment of the situation might be impaired. Pay-off or Convincer The victim receives a small payout as a demonstration of the scheme’s effectiveness. This may be a real amount of money, or faked in some way. In a gambling con, the victim is allowed to win several small bets. In a stock market con, the victim is given fake dividends. The Hurrah A sudden crisis or change of events forces the victim to act immediately. This is the point at which the con succeeds or fails. The In-and-In A conspirator (in on the con, but assumes the role of an interested bystander) puts an amount of money into the same scheme as the victim, to add an appearance of legitimacy to the scheme. This can reassure the victim, and give the con man greater control when the deal has been completed. The long con refers to any of a variety of cons which require more planning, preparation, a longer window of interaction with the con’s target, the mark, and a longer period of time to execute. The long con may also require a large crew or a larger number of involved people to pull off the deception needed to relieve the mark of their cash or other valuables. Unlike a short con, the long con requires time to slowly draw the mark or marks into the con, but often results in very large pay-outs …. The Roper: The member of the crew who identifies the mark, and lures the mark in. The roper usually begins by finding a way to get close to the mark, insinuating himself into the mark’s life. Slowly, he or she makes the con sound enticing by offering the mark what he seems to want, leading up to an introduction to the inside man. From there, the roper’s job is to keep the mark interested. He or she may create the illusion they are a participant in whatever opportunity the con offers the mark. Other Specialized Roles: Specialized players may be hired on an as needed basis, but are not part of a regular crew. These may also be secondary roles regular crew members play if they have the appropriate skills.